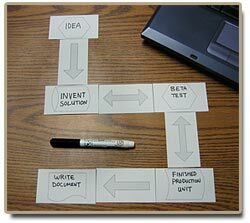 Back in May of 2006 we published a little desktop utility called The Five Minute Flowchart. This business card based flowchart template went on to become one of our most popular utilities and thousands of people have downloaded it. I have been amazed at the uses people have found for it. From a handy planning utility for meetings to an employee workflow tool, these cards have found their way onto many desktops. In the spirit of innovation I would like to introduce the Deluxe Version of the Five Minute Flowchart with five new pages of symbols, arrows, and callouts. With this new tool you can complete a very complex flowchart right on your desktop. It is easy to copy and paste the symbols you use often onto one sheet, or print out the whole set for an upcoming meeting. This new set prints out in Microsoft Word and is compatible with Word 97 and up. You can easily add text while you are in Word or use a Sharpie to add text right on the desktop. You can also add color and texture for added emphasis. These cards are easy to carry around in your Walleteer for quick access at your next meeting. Have fun and go with the flow!